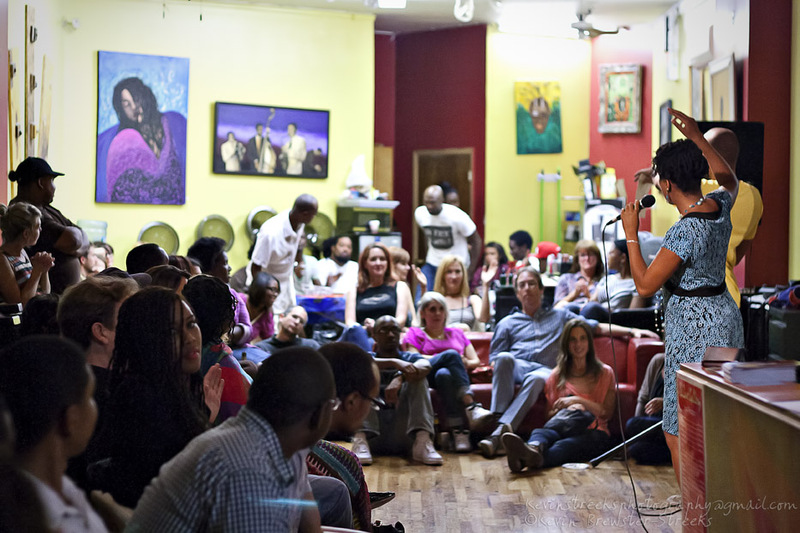 Barbershop Stories is sponsored, in part, by the Greater New York Arts Development Fund of the New York City Department of Cultural Affairs, administered by Brooklyn Arts Council (BAC). Music By: Akie Bermiss And More! BRIC’s Stoop Series illuminates the arts and life around us in Brooklyn through artistic performances, presentations, participatory activities and dynamic conversations. Explore music, visual art, film, media, storytelling, comedy, and other creative fields. There’s something different every week! Hey friends! We are so excited to announce our new partnership with the online storytelling platform Cowbird. Pairing engaging pictures with a short audio clip or text excerpt, Cowbird gives users the opportunity to tell the story behind an image, creating what they call “a public library of human experience.” The site is free to the public and currently boasts more than 47,000+ authors from 184 countries. For our Cowbird page, we’ll be creating a platform where stories are shared via a virtual hair salon, and interested community members can participate by uploading audio and images associated with their story. Since each picture and audio will only be telling a portion of a larger story, we've named this collection 'Barbershop Snippets'. To see the stories we've already uploaded and get a feel for how your story will appear on the website, check out profile here. If you're reading this and think you would be interested in letting us share your story with the world on this new platform or would like more information, please let us know! Shoot us an email telling us the basic overview of the story you'd like to tell, and we'll make plans to record it with you and get it up. Thanks for all of your support! We can't wait to bring you more Barbershop Stories. Including Haircuts/ & Styles By: Denny Moe Jr.
BYOB- You bring alcohol, we'll bring the mixers! Mark Pagán Cyndi Freeman Tarik Daniels Gail Thomas Featured Poet: June Morris Including Haircuts/ & Styles By: Denny Moe Jr.
Pictures from our live show 'Hairy-o-types' are now up! For the full selection, please refer to the pictures tab on our facebook page, or just click HERE! Show pictures from our August show 'Fakin da Funk' are now up! For the full selection, please visit our Facebook Page and click on the Photos tab. Live Show: Fakin' da Funk! Check out Ronica on our YouTube Channel! Barbershop Stories on You Tube! Unable to make it to our kickoff show in July, 'Growth and Transitions'? No worries- we now have exclusive videos on our new You Tube channel! You can also easily access all of our shows under the Videos section in the Media tab. The first is from Ronica Reddick, a performer in Silence! The Musical, who shared a story about a uterine fibroid that took on the personality of Beyonce- "curvy, larger than life, dense... and he came with his own backup dancers." Hilarious and deep! The second is a song by Ja Poet about his journey from Tennessee to New York, as he followed his "dream down the I-95". Also featured is hair stylist, comedian and beat-boxing machine 'Ya Main Man' Mike Walker. Enjoy! Pictures from our kickoff show are now up! Check out the gallery under the Photos tab and let us know what you think. For the complete selection from the evening, please visit our Facebook Fan Page and click on the 'Photos' tab. Hey Barbershop Stories Fam, Thanks for those of you who were able to join us for the kickoff of our event! We had a great time telling good 'ol fashion stories at DeLuxe Gallery in Fort Greene, Brooklyn about growth and transitions. We kicked off the show with Ja Poet, who graced the stage some pretty sick lyrics flowing over the buzzes of people getting their du's did. Next up was Kerri Doherty, who shared with us the secret language of flight attendants, and how she will never be able to see the phrase 'it looks like its raining in Dallas' the same way ever again (spoiler alert- it means someone is having a heart attack in first class!) David Crabb shared a heart felt tale about returning to his home city in Texas, and reconnecting with his long lost friends in a way that showed them all how much they had grown. Ja Poet came back up during the intermission with some soulful grooves with beat boxing by one of the resident hair stylists- Ya Main Man Mike Walker. They both are truly renaissance brothas! In the second half, we had Ronica Reddick share with us the story about removing an 'unwanted visitor' and built in a classic analogy to Beyonce. Lastly Aaron Wolfe finished off the show, with a new haircut that we did on site, with a story about trying to fit in with a band of 'rejects' and a misogynistic lesbian at Hampshire College. When it was all said and done, we had a great time grubbin' on some empanadas and fruit salad, hanging out, and building a diverse community of people who enjoy connecting through stories, poetry, and music. For more information on the performers, please check the Community or the Kickoff Show page. We'll be posting up pictures from the show soon, as well as details for the next show. Stay tuned! Kickoff of our Live Show! Join us for the kickoff of Barbershop Stories with tales about Growth and Transitions. We'll be picking out fros and trimming corners on some 'dus while serving up a hot plate of food. Its all you could ask for a perfect visit to the salon. Pictures of our kick-off show performers. From left to right: Kerri Doherty, Aaron Wolfe, David Crabb, Ronica Reddick and Jakeith Hairston (Ja Poet).